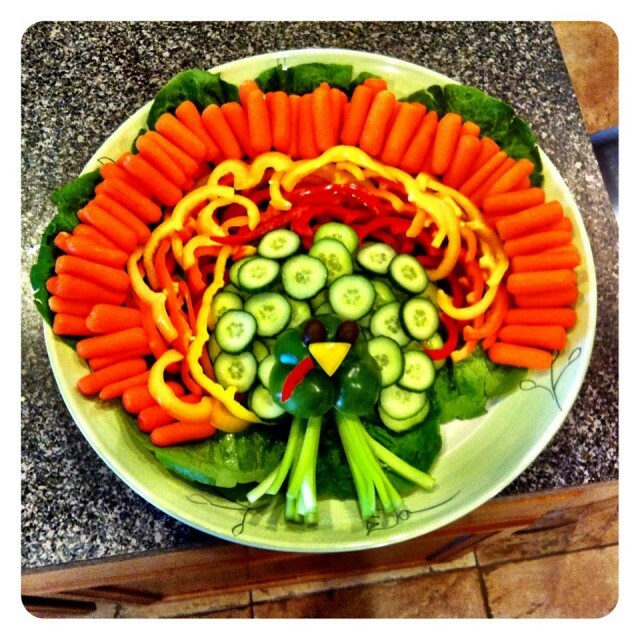 With Thanksgiving right around the corner, we thought we’d share something fun – a turkey shaped party tray. 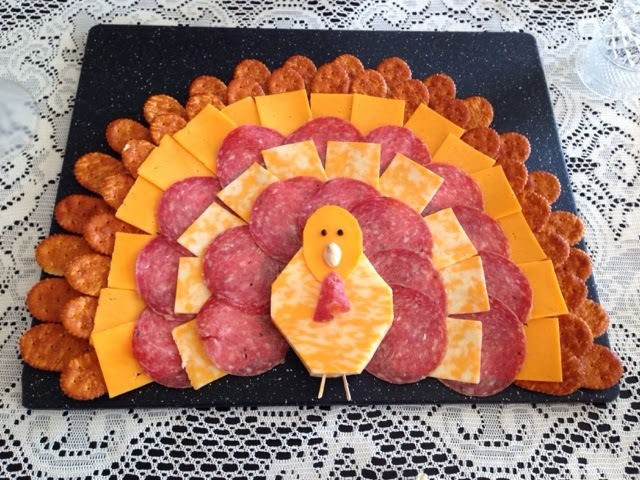 Whether you’re entertaining guests of your own or taking food to share elsewhere with family and friends, these turkey trays are guaranteed to wow both children and adults! 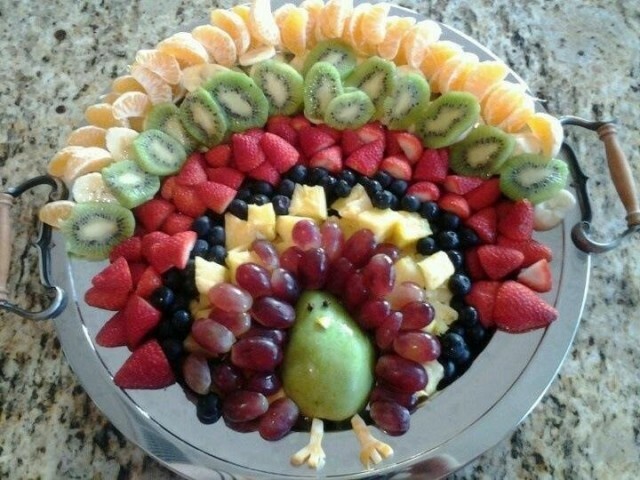 Cut the pear in half to form the base of your fruit turkey. Carefully cut two of the pineapple pieces into little turkey legs. One of the cut edges can then be used as the tiny beak. Begin your turkey’s tail with a row of grapes. Repeat with the rest of the fruit. Be sure to toss the bananas in a little lemon juice to keep them from browning. Lay the lettuce leaves flat across the bottom of a large plate. Place the celery stalks down first. Follow with the pile of cucumber slices, then the bell peppers, then finally the carrots around the edge. Add the bottom 1/3rd the green bell paper to the cucumber pile and arrange use the two olives, yellow bell pepper triangle, and a small piece of red bell pepper to make the face. Serve with your favorite vegetable dip and enjoy! This tray can be made with your favorite meats and cheeses. The trick is to alternate the round and square slices. Begin by placing two rows of crackers in a wide U shape around the edge of the tray. Repeat the process with the cheeses and meat, alternating between the two. Slice the reserved piece of Colby Jack cheese in a large rough oval shape to form the body of your turkey and place in the middle of your U. Next cut a smaller oval out of the Cheddar cheese to form the head. Create the face! Press the peppercorns or cloves into the cheese to form the eyes. A triangle of Colby Jack from when you made the body can be used as the beak. Finally, cut a wattle (the bit that hangs from the turkey’s neck), from one of the meat slices. Place the head on the top of the body and you’re done! Don’t have one of the cooking tools needed for these recipes? Not to worry, QuiBids has you covered! 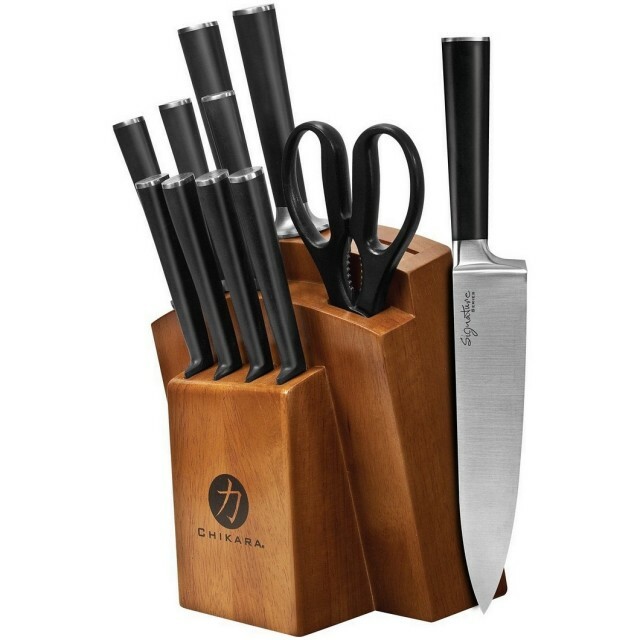 Ginsu’s blades are made from fully forged Japanese 420J2 stainless steel that is known for its stain and rust resistance, strength and its ability to hold and incredible sharp edge. The traditional Japanese style handles are created from heat and water resistant resin. Buy it now for $139.99 and get 14 Free Bids! Using bamboo, BergHOFF has adapted to promote the efficient use of preferably renewable resources and innovative, eco-friendly materials. 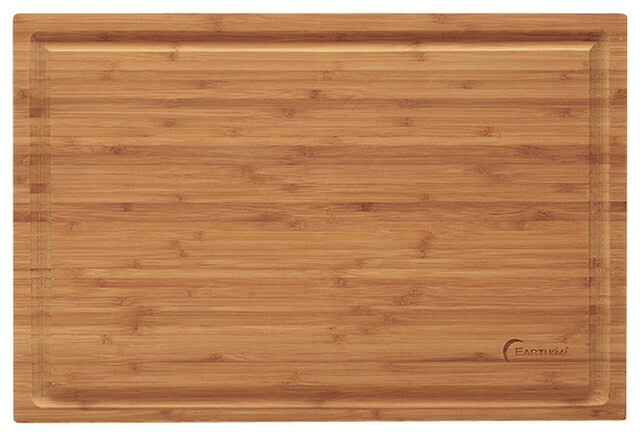 Bamboo is the top candidate to replace wood due to it’s rapid growth. Buy it now for $58.99 and get 6 Free Bids! Follow QuiBids’s board Mmmmm on Pinterest.